There are dozens of 'ghost towns' in Arizona, with various degrees of completeness and preservation - some, like Tombstone or Oatman on old Route 66 in the northwest have many good old buildings but still with some permanent residents, while for many, nothing remains but a few foundation stones or other scattered debris. 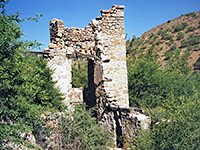 For the more genuine sites, the amount and condition of the surviving buildings tend to be proportional to the difficulty of reaching the site and so the best preserved towns are remote and hard to find, such as Swansea in the Buckskin Mountains of west-central Arizona, where many abandoned buildings stand complete but the site is reached only after a long, difficult journey over rough tracks. Copper Creek is a more typical example; it may be accessed by a rocky, 9 mile dirt road and has quite a few scattered ruined buildings and old mine structures spread out over steep, cacti-covered hillsides east of Mammoth, 44 miles from Tucson. Most of the land is administered by the BLM, though some is part of a working mine, while other areas are within the boundaries of a private ranch. In recent years, the ranch owner has prevented access to a section of Copper Creek Canyon, a part that includes some of the ruins of the old town. Mining operations began in the Copper Creek area at the start of the last century, when one E. R. Sibley established the town to serve what was then known as the Bunker Hill Mining District. By around 1910 there were over 200 residents, and dozens of buildings including a three-storey mansion, home of the Sibley family. 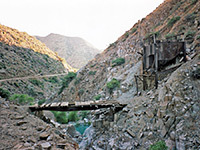 The mines declined quickly, closing in 1917, and soon after all buildings were abandoned. 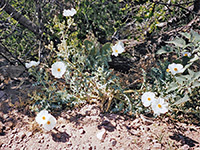 Copper Creek is situated in the Galiuro Mountains, in an out-of-the-way part of Arizona. One approach is from the south, along a dusty, unpaved road that starts from Benson on I-10 and follows the San Pedro River Valley. It travels through arable land which is surprisingly well-settled and cultivated, although it becomes more open and empty further north. As this road approaches US 77, the main road to Mammoth, it passes a large industrial complex with tailing ponds containing turquoise-colored water, evidence of the mining that continues in the nearby mountains, including sites near to Copper Creek itself. US 77 links Tucson with Globe, and is quite well-traveled. Mammoth is a rather forlorn little town with a distinct air of inactivity. The unpaved road to the Copper Creek ruins starts half-way along main street; it crosses the river and another road, follows a litter-strewn dry wash for a mile or so and then climbs steadily up a low ridge, eventually gaining about 1,800 feet. The route is uneven in places and the surface is heavily ribbed but generally fine for 2WD cars. After 7 miles the road drops down steeply past a large open area towards the narrow canyon of Copper Creek, through which a stream flows year-round. The surrounding land becomes steep and rocky with large trees near the water and saguaro cacti on south-facing slopes higher up. The first visible relic is the Copper Creek town sign, on the left side of the road close to the stream. The track fords the creek and becomes more uneven and narrow; a 4WD vehicle may become necessary to progress further. It forks soon after; one branch re-crosses the creek and climbs towards several working mines on privately-owned land, while the other continues along the south side, past a tailing pond and a flat area suitable for camping. The first old structures are found about a half mile further, comprising mine buildings and an iron bridge over the creek to one side, and some concrete foundations on the other. The fast-flowing creek waters are often stained bright turquoise from present-day operations further up the canyon. There are several tunnels in the hillside above, and the rocks show clear signs of mineralization - some are stained various shades of red and yellow, and the cliffs have occasional bluish outcrops. Many rough tracks criss-cross the surrounding land, some still in use but others overgrown and long abandoned. A little beyond the mine relics, the land becomes more level and the track divides once more, next to a ruin that was once the Copper Creek post office; the right fork leads to other mining structures, including the principal site, in an area that still has several open shafts and passageways. The left fork descends to the creek, and continues on through the main area of ruins including the now overgrown and mostly collapsed Sibley Mansion, the schoolhouse/general store, various private residences and several industrial structures. This area now appears to be within the private ranch, however, so is no longer accessible. There is an alternative approach via a rough jeep track over the hills to the south, though this too is currently closed.